I thought it would just be another ordinary baptism at the parish. The usual godparents and parents bringing their children to be baptized came trickling into the church. They presumably came from the parish hall where the seminar for parents and godparents was conducted. That's how it is in our parish. Every Sunday, a seminar is conducted for those attending the baptism sacrament as parents or godparents. This coincides with the last morning mass. So after the seminar, the holy mass has ended or is about to end. When those who heard mass start leaving, those attending the baptism enter the church. Filming a Movie at the Church? Well in this baptism, I knew something was abuzz and different when I saw the mother-butlers whispering to each other. When I asked what's going on, one of them said to me softly, "there's an actor!" What she meant was there was an actor in the premises. What I immediately thought was that there was a movie being filmed near the church. It's not at all unusual since the parish church has been popular with cancer-stricken devotees. But then the mother-butler motioned that the actor would be coming inside the church as a godparent or sponsor. When I asked who it was, I didn't get a name. I didn't give it much thought until I saw those parents and godparents who came in earlier turning and craning their heads to one direction. The movie actor was now inside the church. The actor's name is Ronnie Ricketts. He was wearing his trademark sunglasses. Good thing he wasn't wearing a cap or a head bandana while inside the church. He was quite popular in his heydays as an action film star. Now he seems to dabble a little in politics. Apparently, he was one of the godparents of one of the babies to be baptized. As more and more folks arrived inside the church, a few would point him out. Well, no surprise there. Finally, the children to be baptized were all complete and the officiating priest came out from the sacristy. I don't know if he knew about Ricketts (the mother-butlers could've told him), but he just acted normally. If he didn't know, I'm sure he was wondering why some folks were looking at the back. 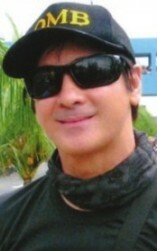 I could understand that Ronnie Ricketts would be wearing sunglasses. But with everyone now gawking at him, I'd think he already knew that he was recognized. Frankly, I thought he was better off taking off his glasses if only to draw less attention to himself. A little later, I saw someone in the pews who's also a mestizo. He sat at the same pew where Ronnie Ricketts was sitting. Initially, I thought he was the father of the child that Ronnie was sponsoring. I even thought the two of them were brothers or somehow relatives. After all, they're both mestizo-looking. I learned later that the guy is the former actor Rey "PJ" Abellana. He seemed to have gained weight after being inactive in show business. That's probably the reason why I mistook him as the kid's dad with his "family man" image. I don't think he's still making movies. He was affable and he appeared to be good buddies with Ricketts. Well, apparently, the kid's parents had some connections to showbiz personalities, hence getting movie actors as sponsors or godparents. So what happens when you have movie actors in the premises? Lots of pictures with them, naturally! Everyone wanted to have pictures with them. Yes, even those parents of the other babies. In fact, during the picture-taking of Ronnie Ricketts' group, everybody else were taking pictures of THAT group. Ah well, what else is new. When the sacrament of baptism was over, I took off early as I usually do. At the parking lot, a lay minister and I managed to see Ronnie Ricketts walking too with someone who looked like a driver. Apparently, he had to leave early too - maybe to avoid lingering for more pictures. He seemed to have recognized me as the commentator and waved at me. Well, it was either me or the lay minister I was with. That lay minister helps conduct seminars to parents and godparents. So Ronnie Ricketts would recognize him had he attended the seminar.